Hello. We have been so busy in the garden and on the outside of the house. Before it gets hot, we are enjoying the weather and completing outdoor projects. We restored two Haver-esque corner living room windows, but I have not taken photos. My spouse did all the sanding, and it took him many evenings! At one point it looked like a failure; that's when the bare wood looked so bad, and the glass on the bottom panes fell out, and the outdoor cats visited. When he finished sanding and painting, the glass people installed tempered glass on the floor windows, new glass in the remainder, and putty. Old school. Even here, the putty takes a year to dry, but the 71 year old windows look beautiful. We also have someone working on the 3/4 of the yard that you don't see. We just can't move caliche. The ground is as hard as stone and the dirt is clay, and it needs to be regraded as well. They only come once a week. 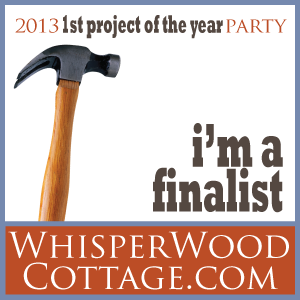 But, we found some easy projects to do. Copper was suppose to be Copper in the title as in faux copper. So four spray cans latter of metallic paint, we had faux copper trellis arches to hold the shade cloths. My spouse painted them in an empty part of the yard, but he always left a bare spot so he could return them to the holders for drying. When they were dry, he finished painting. We also stained the outside of the beds with Sherwin Williams outdoor opaque stain in River Birch. It doesn't completely hide the grain, but I do like it less busy. Now my daughter is much happier with the view from her room, because her window looked out on it. Everything is blooming here; the lettuce is huge; the citrus blossoms' scent enchants. I know so many of you are still cold, but you can feel some comfort in the fact that we get four months of unbearable weather. This last photo is of the stained beds and "copper" arches. Love those flower beds. Seeing green and flowers is uplifting. Thanks. What a great idea! 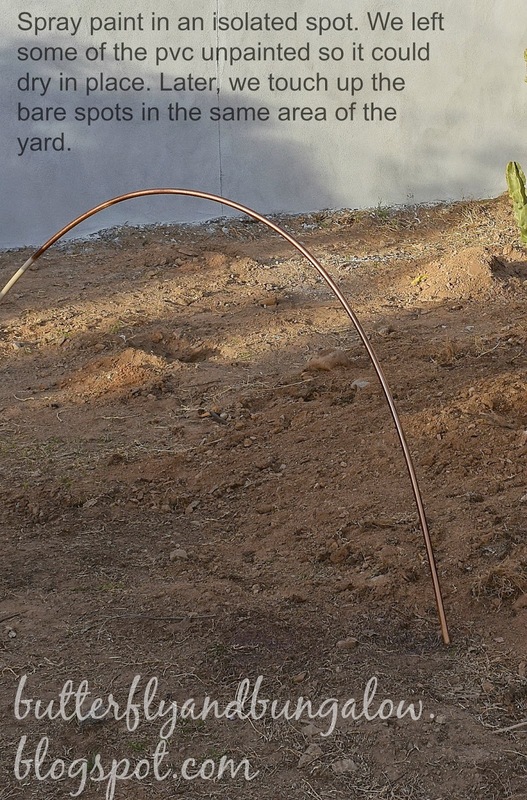 Your garden beds look wonderful and the "copper" arches enhance their beauty! Thank you, Stacy, for your sweet visit and nice complement. Have a wonderful week. Lovely to see things growing. You have brought hope to my New England heart. You are very clever to use spray paint for this project. The result is lovely. awesome!!! 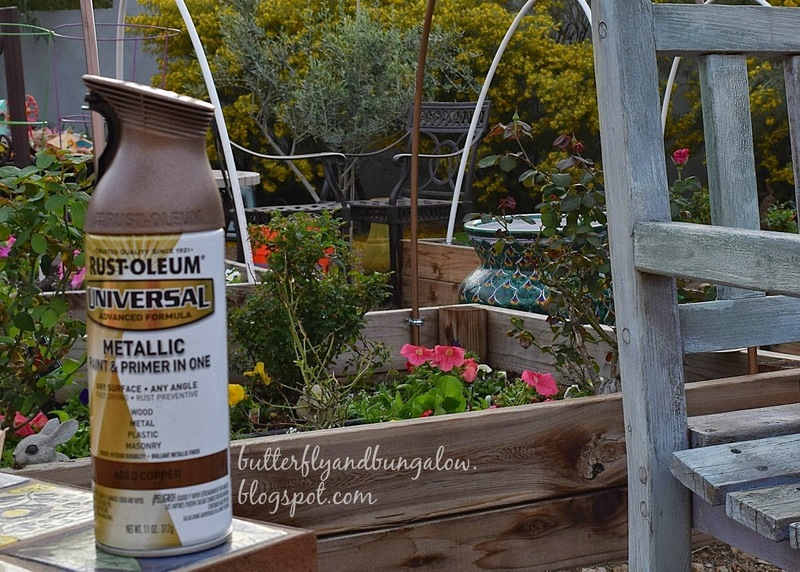 Thanks so much for sharing that pvc & spraypaint tip! Your garden looks beautiful! Thank you, Judy, for your sweet complement. Thank you, Diana. I wish, I could send it sometimes! Thank you, Pura Vida. Have a wonderful week. Que encanto essa sua ideia. Adorei...e suas fotos são maravilhosas! Thank you, Beatrice. I agree; it is satisfying to finish something successfully. These look amazing. I know they are practical but they add a certain structure. It reminds me of a formal victorian garden with the lovely raised beds and statue. I'm glad you're enjoying the weather there at the moment and 'making hay' before the sun shines so to speak! An Irish saying!! Thank you, Sweet Auburn. Yes, I agree with you. It does give it some architecture. Love that expression! The arches look so nice. The gold is very attractive. The color and content of your pictures are amazing. I live in the AZ mountains and also have raised beds. These would be very helpful in protecting our plants. Thank you for your sharing! Thank you, Tamara. It works to keep them warm too, but we might only have three nights of cold. I wonder if a smaller arc would work better for cold nights or maybe it only depends on the cloth. My cloth is shade cloth. Pvc bends, but it depends on the thickness, so test it. If you need the exact thickness, I'll find out from my spouse. Have a wonderful week. I love your flower beds and your garden looks fantastic! Thank you, Little Treasures. This home has been a lot of work. Kudos to you for restoring your old windows, Su! We reglazed several old windows and it's a lot of work. It's hard to find skilled workers that do it well. 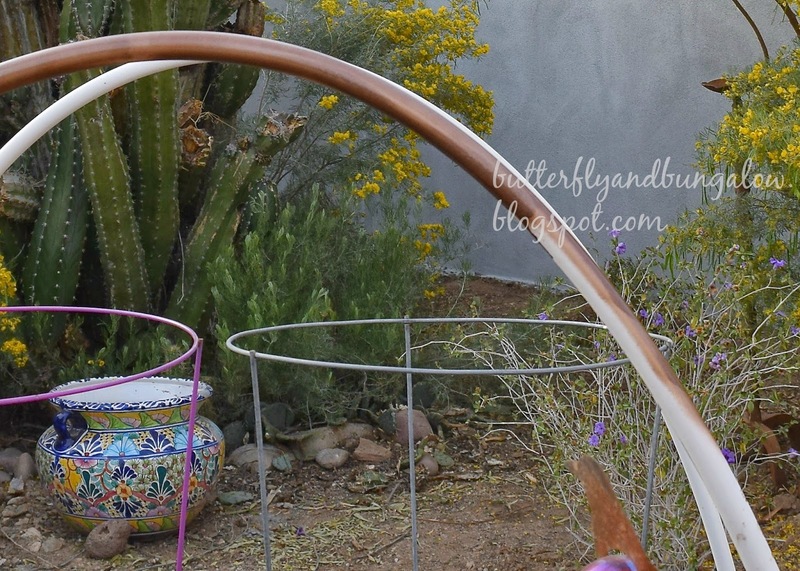 Your gardens are lovely and you certainly fooled me with your faux copper arches! I guess we all have times of year when we can't enjoy the outdoors. Our time is now with the long spell of -25 temps. Enjoy your beautiful gardens! It is hard to find any one to do it! I found the company from a city website on the historic districts requirements. There was a pdf that a community organization made, and it was in that. The windows were tested first, and there was no lead. There was no lead in this entire house, so we were really lucky. It was a ton of work for my spouse to remove all the layers so that the glass company could install the new pieces of glass and reglaze. The transformation to copper makes a world of difference. Love the Gothic arch to them. Looking forward to seeing the restored windows, I applaud your husband for staying with the project, I'm sure they look stunning. We're still in bitter cold temps, gardening is a daydream right now! Thank you, Vera, and it was so inexpensive! Oh, he kept going. He is so persistent. Yes, it was, Kim. I put Copper in italics in the title, but it didn't come out that way. xoox Have a wonderful week, and stay warm. Your garden looks lovely! 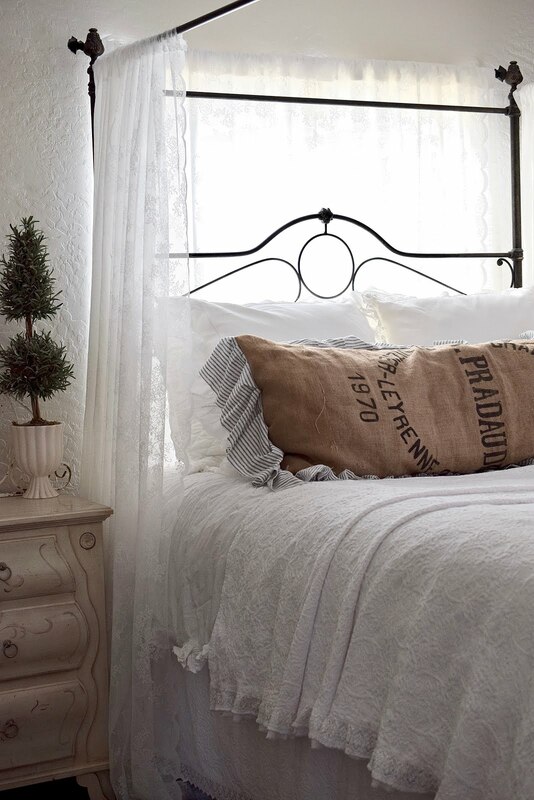 What a great idea using the faux copper arches! Enjoy your space. Thank you. I've made real copper ones before, but they were straight, and of course copper is very expensive these days. I'm happy this worked. The raised beds with the new supports for the shades are practical and attractive. I like the way you've found a way to solve a problem in an economical way with the copper spray paint. You have unique and unusual touches everywhere in your home and garden. I can imagine the perfume from the flowers and your daughter must love looking out onto the garden from her room. Thank you, Linda, that was a sweet thing to hear. My daughter loves it, the pvc now looks pretty and practical. Have a beautiful week. WoW! It's so refreshing to see gardens at this time of year. We are still in winter but spring is certainly on its way. Those flower beds look great with the arches. They had an interesting touch, for sure. Thank you, Linda. You too. Stay warm and have a wonderful week. Thank you, Nancy. I agree. Spray paint is amazing. You have been as busy as a bee :) Your flowers and gardens look beautiful, my friend. Happy Monday to you! Love your planter boxes and the arches look great...such a great idea! Hope you'll hop over and share at Amaze Me Monday. Thank you, for your visit. I will. 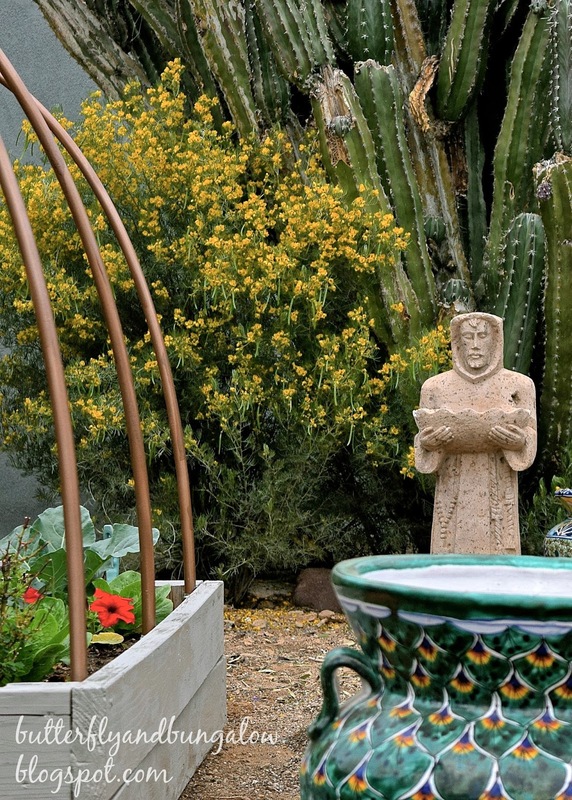 Great Garden and the copper arches are genius! It is so pretty to see your garden. I love the copper arches they really make it look gorgeous. Ahhhh I am going to live vicariously through you with your beautiful garden. We have a few months to go before we see green or blooms here in the midwest. It all looks so lovely. Thank you, Kris. Here it warms up right after Christmas. Time well spent in your garden, every bit of it is taking on its own beauty. The paint finish is genius. Looking forward to each and every post. Thank you, Dore. Have a wonderful, creative week. Very clever! I love spray paint and use it often. I was looking at old PVC pipes that were removed when I had PEX plumbing installed. I was thinking it might be time to get rid of it since I hadn't come up with a way to re-use it, so your post was just in time. Your garden is beautiful. It all looks so wonderful! What a clever idea to have those arches. Thank you, Sarah. We are enjoying the pleasant temperatures while they last. We used them last summer to keep the plants from burning or roasting. It looks great! I can't wait to start putting in our raised beds. It's raining up here today, so no outside work for me. Thank you, Rue. I will. We are still touching up the walls where the paint was stripped. Oh, you know I love your garden - but this new project is fantastic. Looks awsome!! Great idea to spray it copper! Thank you, E. I think you could do a garden on your deck. 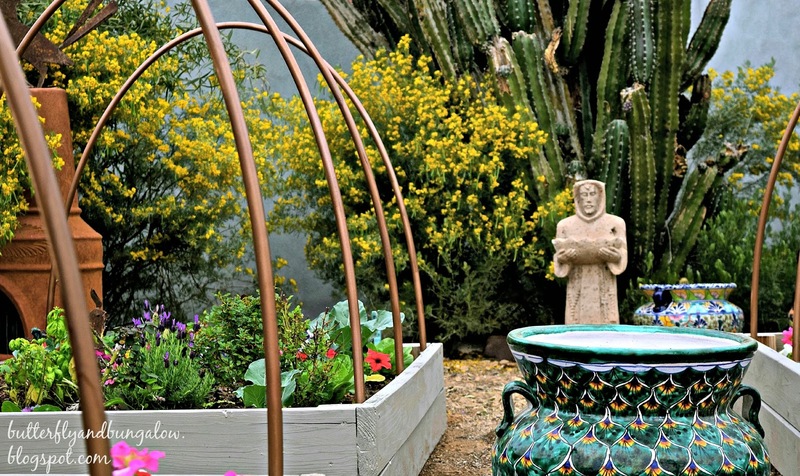 The raised beds and copper arches are beautiful! What a clever idea! I think our ground is frozen at least 4 feet deep. No lettuces for us. I can't believe how cold it has been in most of the country! It's such a good idea to have painted them "copper" because this colour is beautiful with the greens of leaves. Thank you, Magali. Arizona is the copper state. There are lots of copper mines, though mostly closed. Nevada is the silver state. California is the gold state. Your raised beds are beautiful...especially the way you have decorated them!! Thank you, Debbie. A little bit a paint goes a long way. Have a wonderful week. What a lovely place so serene. Your garden arches really add a special touch. Lucky you to be enjoying the outdoors along with painting. Will the copper weather as time goes by? Thank you, Rosemary. It's "faux" I used the one paint that was already burnished, but they do sell verdigris. 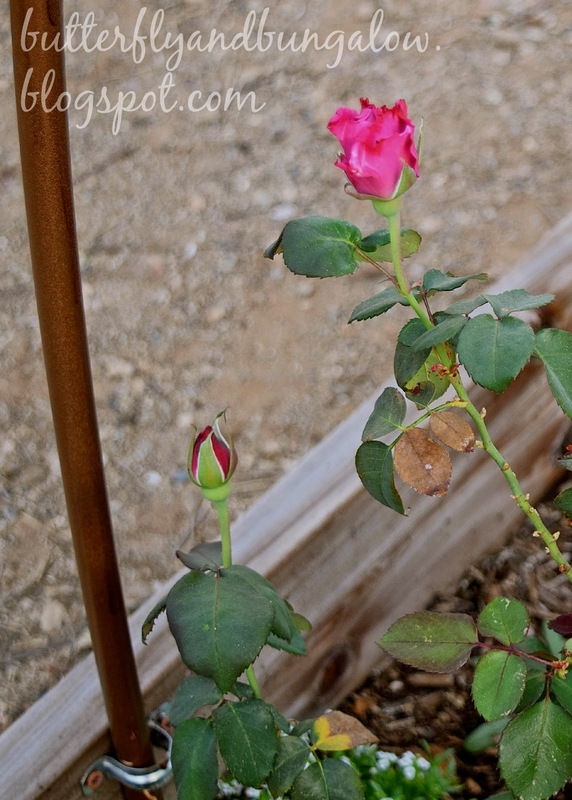 When I once had a really copper trellis it aged, but it oxidized slow in the desert. When it was eight years old, it was about this shade, not green. My kitchen sink is copper, and I wipe it down after use however, along the edges where it stays damp it can turn green over a couple of nights. I love the copper look. Thank you for the tip. I forget how just a bit of spray paint can make something look so beautiful. Well done! Thank you, Carla. Spray paint is inexpensive and very straightforward to use with quick results. Wow! That looks wonderful. It adds so much. A little spray paint goes a long way and makes a big impact. Painting the pvc pipe is a brillant idea. It looks wonderful. Our raised beds are 8 yrs old now and quite weathered but the stain is another wonderful idea. I have to say my favorite part of your garden will always be your statue. Is it St. Francis? Our soil is clay also. When we bought our home the backyard was bare, hard pan, clay. We have cultivated every inch of our gardens by ourselves. It is rewarding to see how much we have done in 8.5 yrs. its is so much work but so worth it. I know you understand this. Last year squirrels found their way into our yard. We had never had them before. What a problem they are! My husband had to build a cage out of wood and chicken wire to place over our garden beds to keep them from eating out tomatoes! He made doors for us to be able to access the fruit. It will be a few more weeks till we can begin planting but we have renewed our beds with fresh soil so they are ready. Can"t wait. Thank you, Kerrie. He is my favorite too. It is St. Francis, and he is the first object I put out there. Someone carved him out of canterra. I found him in Santa Fe. Yes, it is a lot of work keeping the little critters out. Our last home was in the desert. The cottontails ate everything but the roadrunners harassed everything but them. The animals so love what we do. Don't they? What a great idea to stain he garden box lumber. Now I've added that to my long list of must do items. I have seen the copper paint in the store and am amazed at how great it looks! Your blog posts are always a great source of inspiration. Thank you, Dana. SW has so many outdoor colored stairs both transparent and semi-opaque. My spouse built the beds out of redwood, but in the desert they take so long to go gray! They were beginning to look blotchy, and we were not sure they would ever go gray here. We decided on opaque, but if I had done this in the beginning I probably would of gone transparent. The stain will help prevent the wood from drying out in the heat. Love your garden! I can imagine the scent of the citrus blossoms. We are still in the bitter cold, snowy winter, but your garden makes me happy, and hopeful that spring will eventually come. Great arches, love the copper paint idea, brilliant. Thank you, Judith. It was really easy to do, and at least the shade clothes will hang from something prettier. Thank you, Alessandra. xoox It's coming along. Thank you, Cindy. Yes, we do! The summer is the only time I don't like being here. Thank you, BJ. I can't believe how cold it got where you are. Your yard is beautiful and you and your spouse did a great job with it. 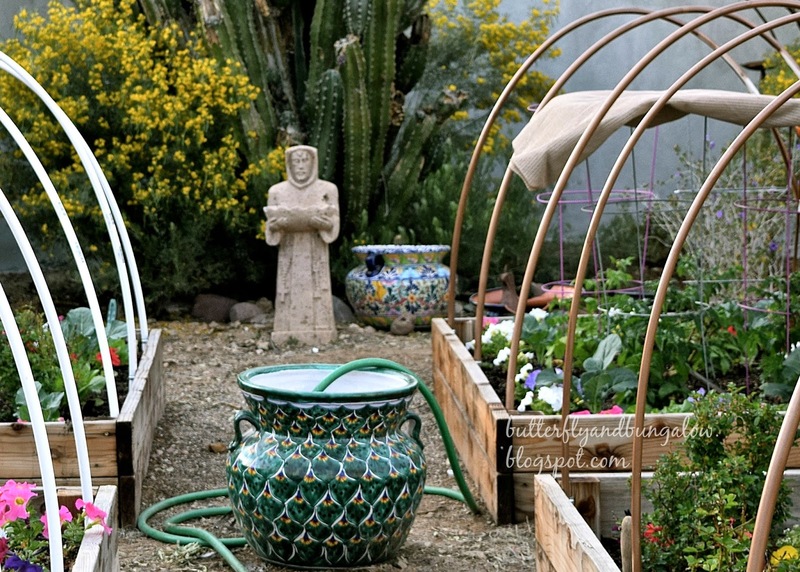 The garden beds are so pretty and I really like your statue and pots. So glad you have nice weather there. It is still so cold here with ice and snow. Enjoy. Thank you, Julie. I hope you are staying warm, and that it warms up soon.